Despite tough headlines for many of the industry’s biggest retailers, one specialty retailer is bucking the trend in an industry plagued by indecision and distraction. Cycle Gear, a specialty retailer of motorcycle parts and apparel with 140 stores located in 38 states, is leading the way by demonstrating how to increase comp sales quarter after quarter—all while keeping wage budgets in line. They are hitting their goals, growing, and opening new stores. It didn’t take long to see results. Just five months after the official launch of their new conversion program offered by HeadCount Corporation, Cycle Gear was already seeing great comp results, and by the end of the year, the company had their best Black Friday ever. Data that drives problem solving, not just measurement: As an example, two stores had opened within weeks of each other with similar demographics. However, there was a 900-basis point difference in conversion between the two locations. With the new program, by the end of the day, O’Keefe and the store manager had solved the problem. “I told her, ‘That’s the answer, right there. That’s the golden ticket. That’s what you control’,” said O’Keefe. The importance of ‘controlling your four walls’: When a store is empowered to drill down to what they can control, overall it doesn’t matter if foot traffic is down or weather is bad, staffing factors and conversion rates can be adjusted to increase comp sales. Cycle Gear’s store and district managers proactively use their new data to control their four walls instead of worrying about traffic. Critical shift in staff scheduling approach. Cycle Gear went from automating staff scheduling against sales transactions to scheduling against foot traffic. This shift in approach, along with small tweaks in scheduling, resulted in a huge payoff across the board. Power in simplicity. How much can two minutes help? A lot. Cycle Gear has a new, simple, everyday habit that is helping them drive their business forward. Field managers are highly engaged. 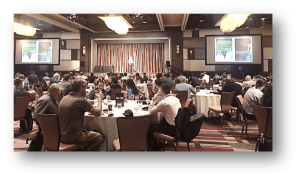 To ensure everyone understood the key concepts and were inspired by the new program, Cycle Gear launched the program at their store managers’ conference in Las Vegas. O’Keefe says the teams were blown away by the launch. Image caption: Headcount Founder and CEO Mark Ryski delivering a kick-off presentation at Cycle Gear’s Manager’s Conference in Las Vegas.